Bartley Sawatsky, executive director of the Fellowship of Grace Brethren Churches, begins the meeting of national ministry leaders. 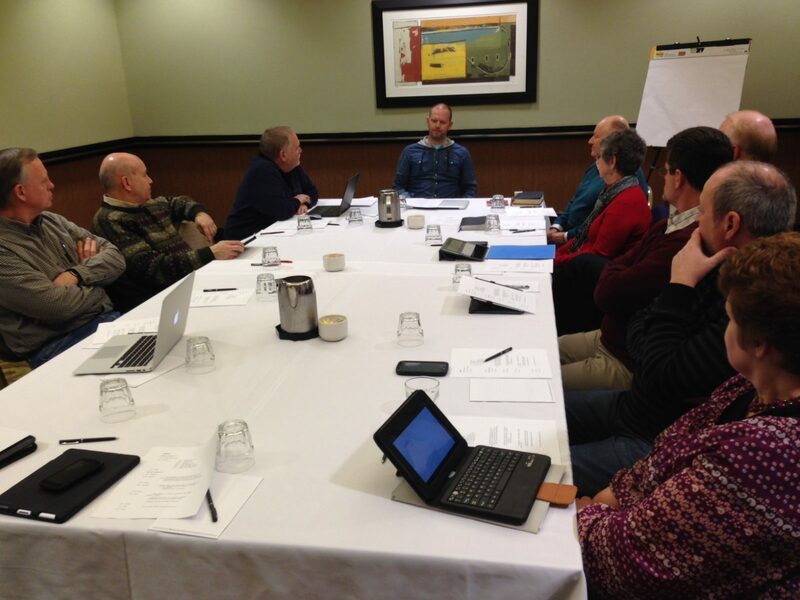 Leaders of national and cooperating ministries that are affiliated with the Fellowship of Grace Brethren Churches are meeting this week in Columbus, Ohio. Gathered at a north side hotel, the group, led by FGBC executive director, Bartley Sawatsky, gathered Monday evening for dinner then retreated to an adjacent room to meet. Sawatsky, who has been talking with various leaders in the FGBC over the last six months since becoming executive director, led the discussion about the current state of the fellowship. Today’s (Tuesday) session will center around the path for the FGBC, brainstorming how each of the national ministries can participate, and determining ways the ministries can cooperate. They plan to conclude by late afternoon. National ministries in the Fellowship of Grace Brethren Churches are those that have representation on their boards from three regions of the country: east, central, and west. These include Encompass World Partners, Go2 Ministries, Grace Brethren Investment Foundation,CE National, Grace College and Seminary, the Association of Grace Brethren Ministers, the Brethren Missionary Herald Company, and Women of Grace USA.